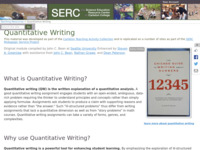 A variety of resources that use quantitative thinking in the classroom are available through SERC websites. The resources include extensive collections of project pages with tutorials and examples and teaching activities at various educational levels, some of which contain visualizations that may be useful for lectures or labs are also available. Click the image above to browse teaching activities related to quantitative skills, thinking, and reasoning. 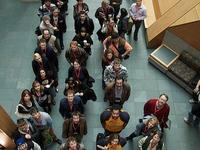 Collections are contributed by faculty and may include working with real data, models, and more. Developing Quantitative Reasoning: This module describes how an instructor can intentionally incorporate quantitative reasoning goals and objectives into their classes. It contains examples of strategies for designing and assessing student work. It also presents a collection of profiles of faculty across the curriculum who are already addressing quantitative reasoning in their courses. 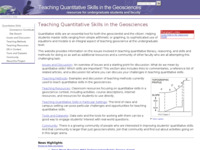 Teaching Quantitative Skills in the Geosciences: This website provides information on the issues involved in teaching quantitative skills and methods and activities for doing so as well as additional resources and a community of other faculty who are all attempting this challenging task. 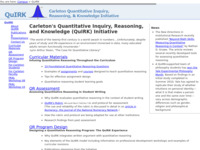 Carleton's Quantitative Inquiry, Reasoning, and Knowledge (QuIRK) Inititative - QuIRK is a campus-wide, multidisciplinary effort at Carleton College to address quantitative issues across the curriculum. The initiative runs campus events and makes resources available to the campus community as well as the broader public. Teaching with Spreadsheets Across the Curriculum - This project uses modules with short PowerPoint presentations to guide students to build spreadsheets to solve one or more mathematical problems in the context of their courses. The students determine cell equations that produce the calculated numbers shown on the spreadsheets. Examples are provided for a variety of topics, including National Parks, volcanology, geologic hazards, and more. Quantitative Writing - This module is part of Starting Point and provides information, tutorials, and examples that aid in using quantitative writing in the classroom. Quantitative writing tasks students with analyzing and interpreting numbers and data through writing to bring meaning to the data. 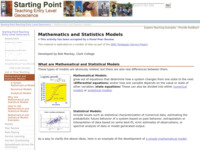 Mathematics and Statistical Models - This module provides basic information about mathematical and statistical models,how they can be used in the classroom, and provides activity examples that utilize both. 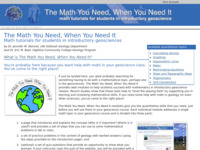 Math You Need - These modules cover important quantitative topics in intro geoscience courses. Each topic includes an instructor's page, quantitative information for students, and a practice problem set. They culminate in an automatically-graded online quiz that gets submitted to the instructor. The project is designed to give students the quantitative knowledge that they need, just before they need to use it in their concurrent geoscience course and includes pre- and post-testing and self-paced modules. 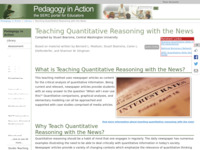 Teaching Quantitative Reasoning with the News - This module, from Pedagogy in Action, describes how one can use media articles as the main content for a course focused on honing students' ability to critically think about and analyze quantitative information. Making and Testing Conjectures - This site, part of the CAUSE project, provides basic information about conjectures and why/how they can be utilized in the classroom as an effective way to engage students and to develop their reasoning skills. Example activities, mainly related to statistics, are also provided. 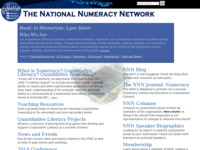 National Numeracy Network (NNN) - This organization offers its members a network of individuals, institutions, and corporations united by the common goal of quantitative literacy for all citizens. Through national meetings, faculty workshops, research initiatives, and information sharing, the NNN aims to strengthen the capacity of our country in the quantitative areas of business, industry, education, and research across all disciplines. This site includes access to the NNN journal, teaching resources, and other information. Numeracy Infusion Course for Higher Education - This project by the City University of New York (CUNY) Quantitative Reasoning Alliance aims to foster the infusion of quantitative reasoning (QR) instruction and assessment into undergraduate courses across the curriculum. This project also presents best practices and case studies of how QR is taught at a number of institutions. Keyah Math - This project developed a series of versatile online activities in mathematical geoscience, using the natural and cultural landscapes of the Southwest United States as context and setting. These place-based exercises are designed to enhance any undergraduate geoscience course, and may be of particular interest to students and teachers with cultural ties to the Southwest, including American Indian and Hispanic students and teachers. DataCounts! Exploring Society by the Numbers - DataCounts! 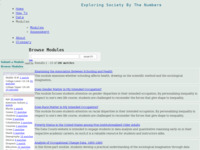 is an interactive website designed to help integrate social statistics into the classroom setting. The site provides access to several collections of data and houses a collection of teaching modules that have been created by teachers across the country to integrate social science data into their classes. Starting Point: Teaching and Learning Economics - This site introduces economists to innovative teaching strategies developed both within and beyond the discipline of economics. It provides instructors with the tools to begin integrating and assessing these teaching strategies in their own classrooms and promotes the sharing of teaching innovations among instructors.